EBIKE HIRE We are happy to take our customers out on a test ride before you make a purchase. 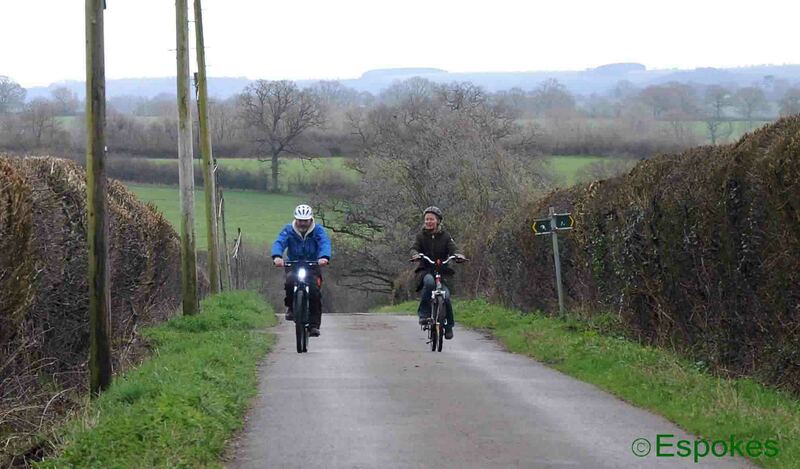 However, you may wish to try the ebike for a day or a week to see how it fairs on your commute, or up that steep hill to see your friend, or you may just wish to have an ebike for the weekend to cruise about the countryside with ease, taking in all the beautiful sights.If this is the case then hiring an ebike is the ideal solution for you. We have ebikes to suit everyone, please call 01256 353465 to book. Each ebike comes with a lock, battery charger and helmet. A 14Ah battery should give up to 50 miles cycling on one charge and a 10Ah battery up to 30 miles. These distances are approximate and are dependent on rider weight and the amount of power assist being used especially on hills. Delivery of electric bikes at additional prices. Two forms of ID are required, one showing proof of your current address e.g. Utility bill received in the last 3 months. Security deposit will be taken on credit card; this is fully refundable on safe return of all electric bikes and equipment hired. UK legislation states that you must be 14 years or over to ride an electric bike. Proof of age may be requested. I wasn’t expecting to test ride an electric bike. I’d been looking forward to pushing myself a bit on an 11-mile ride on my mountain bike. However, the rear brake was binding and it was more challenging than I anticipated! I admitted defeat after 3 miles, and accepted Laura’s offer to finish the ride on her electric mountain bike. I’m so glad I did. It was obvious from the start that I was going to enjoy the experience…It was a nice bit of flat, straight road, so very tempting to see how fast I could get it to go! Fairly fast, as it turns out – though I didn’t quite have to brake when I reached the 30mph speed limit. I tried the bike without power and it rode like a normal bike – in fact, it felt much lighter than my own mountain bike. On eco mode (the lowest setting) it helped me get up the long drags without causing the usual spongy feeling in my knees. On a busy main road, it was reassuring to have an extra bit of help up a hill when there was a line of traffic behind us. I had my first experience of riding an ebike on Sunday, 15th April 2018. The style of the bike was vintage with a retro appearance. I would not normally go for this style and prefer a bike to look fairly modern. It was not too heavy to manoeuvre and the seat was very comfortable and adjusted to my height before setting off. It took me a while to get used to using gears along with electric power but once I mastered the concept I felt able to put in as much effort as I wished. Going through the power button to select different power modes was a bit strange as when it was at level 2 and wanted to reduce the power of the bike I had to increase to level 3 first. Going up hills was completely effortless and a real pleasure to ride. The only problem I can see with this type of bike is to know how far to travel before running out of power – it is very easy to just keep riding. Finally, I think I understand the feeling of freedom my husband has from riding his motorbike! Having been offered the chance to use an electric bike for the first time, I took the chance to try something new this weekend. After a bit of instruction, and a quick practice around the car park at our meeting place we were off! The plan was to do about 8 miles around the rural village of Silton, an area with several significant hills and undulating countryside lanes. The first few miles were long steady hills which on my own hybrid mountain bike; usually cause me extreme breathlessness, a beating heart, shaky legs and the need for water at regular intervals. On my borrowed mount there was no need to worry. I experimented with the gears and battery boost and found a level which really helped my legs and made the ride easier and far more enjoyable! You do need to keep pedalling and you can adjust the challenge depending on your own energy and strength, and although I am relatively fit, on this occasion, I took the help on offer and used a mid-range power so the effort was not overly challenging. Having got used to the bike, within about 15 minutes I felt quite confident and was even able to stand up on the pedals to peek over garden walls and take in the lovely houses and countryside we were passing by. By the end of our ride, I was grinning happily and really enjoying the speed, the lack of effort required to tackle the hills and I got a glimpse of the joy my husband feels from riding motorbikes. If I ever need to commute, or cover a good few miles every day in a hilly area I would certainly consider getting one of these super bikes. I would recommend everyone to have a go and feel the wind in their faces without the (sometimes) discomfort of cycling up steep Somerset hills! Thank you, Laura,! It was great fun.